Styled by Zagato, the GTZ is essentially a unique Bentley Continental GT with a humungous price tag. If this special edition Bentley rings a bell then it&apos;s because you are probably recalling the model that was introduced at the 2008 Geneva Motor Show. 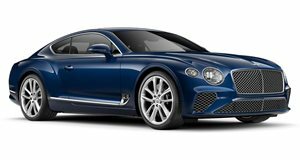 The result of a joint venture between Bentley and Italian styling house Zagato, the Continental GTZ is essentially a 600hp, twin-turbo 6.0-liter W12 Continental GT Speed with a Zagato bodywork and special two-tone finish. Weighing about 100kg less than the GT Speed, the special edition GTZ will comfortably hit a 200mph-plus top speed. At the weekend&apos;s Concorso D&apos;Eleganza event in northern Italy, an even more special version of the car was unveiled sporting special panels covering the rear wheels. That aside, it features Zagato&apos;s signature double-bubble roof, a round tail with a unique taillight design, and a hand-painted pin-stripe that&apos;s the same color as high quality tan leather, which comes complete with Z motifs hand-stitched into the seatbacks. The original GTZ was priced at €1.3 million so expect this extra-special version to cost a little bit more.